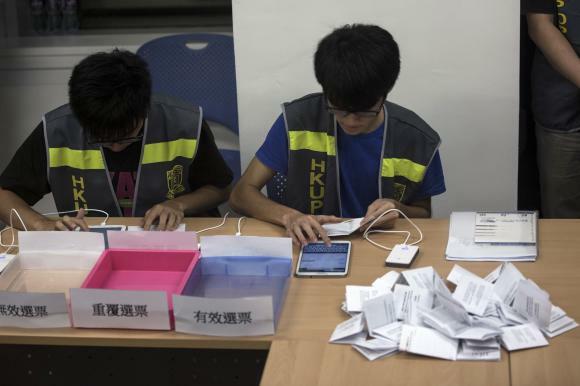 Electoral assistants count ballots at a polling station after the last day of civil referendum held by the Occupy Central organisers in Hong Kong June 29, 2014. Hong Kong is bracing for its largest protest in more than a decade after nearly 800,000 voted for full democracy in an unofficial referendum, a move likely to stoke anti-China sentiment in the former British colony. The annual July 1 rally, marking the day the territory returned to China in 1997, will focus on pressuring Beijing’s Communist Party leaders for full electoral freedom, organizers said, and could draw the largest turnout since 2003, when half a million people demonstrated against proposed anti-subversion laws which were later scrapped. Several groups have indicated they will stage overnight vigils after the march in a possible prelude to a planned campaign to shut down the city’s financial district. “We can see that Beijing is eroding the autonomy of Hong Kong, and we want to show we don’t fear central government oppression,” said Johnson Yeung, convenor of the Civil Human Rights Front, one of the organizers of the march. Some 792,000 people, more than ten percent of the city’s seven million population, voted in the referendum urging Beijing to allow opposition democrats to run in a 2017 citywide election for a new leader. The vote was organized by Occupy Central, behind the financial district shut-down plan, and comes at a time when many Hong Kong residents fear civil liberties are being stripped away. Hong Kong returned to China with wide-ranging autonomy under the formula of “one country, two systems”, allowing such protests to take place. But China bristles at open dissent. Organizers of the Tuesday march expect more than half a million people to spill on to the streets, partly as a retort to a controversial “white paper” from China’s cabinet in early June – an official government paper stressing Beijing’s complete control over Hong Kong. Two groups, Scholarism and the Hong Kong Federation of Students, say they will stage a sit-in after the July 1 march lasting until the following morning. Alex Chow, one of the leaders of the federation, said he expected thousands to take part, with some analysts warning there was a risk this could become a catalyst for blockading the city’s central business district. In the referendum, 91 percent of voters said they wanted public nomination of candidates, while nine percent abstained. Some 88 percent said the city’s Legislative Council should veto any proposal that wasn’t in line with international standards. Benny Tai, a leader of Occupy Central, urged voters to come out and march, but ruled out taking action to blockade the central business district on that day, saying it “wouldn’t be the right moment”. A decision would be taken later, depending on the government response. While Chinese and Hong Kong officials have warned Occupy Central would damage the city’s standing as a financial center, there appears to be a softening stance given the risks of provoking a greater backlash. “They’ve changed their tone,” said Joseph Wong, a former senior government official and political commentator. “They’re concerned about the high turnout and they don’t want to be seen to be adding fuel to the fire,” he added, noting recent comments from Hong Kong’s number two official, Carrie Lam, who said the government would heed the poll’s findings. Activists say it is a peaceful movement demanding a “genuine choice” for Hong Kong voters. Barrister Martin Lee, one of the founders of the main opposition Democratic Party, said a large turnout of marchers was key to putting pressure on Beijing. But some Hong Kong politicians do not see much room for compromise. “China has always been like that … if you are tough, I’ll try to be tougher,” said Rita Fan, a senior Hong Kong delegate to China’s parliament, the National People’s Congress. China will court-martial one of its most senior former military officers on charges of corruption, state media said on Monday, the highest-ranking official to date felled in President Xi Jinping’s battle against deep-rooted and pervasive graft. 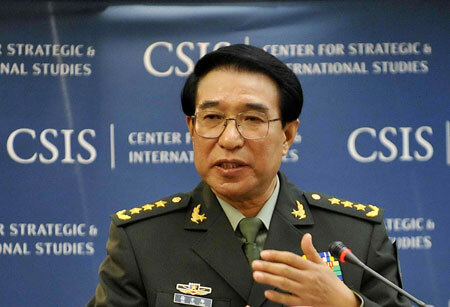 Xu Caihou retired as vice chairman of the powerful Central Military Commission last year and from the ruling Communist Party’s decision-making Politburo in 2012. Xi heads the Central Military Commission, which controls the 2.3 million strong armed forces, the world’s largest, and has repeatedly reminded them to be loyal to the party. Xi has made weeding out corruption in the military a top goal. It comes as Xi steps up efforts to modernize forces that are projecting power across the disputed waters of the East and South China Seas, though it has not fought a war in decades. “This is earth-shaking. To the entire party and the country, this is heartening news that sends a strong signal. It’s a clap of thunder,” said Ni Lexiong, a military expert at Shanghai University of Political Science and Law. “The party will never allow a hiding place for corrupt elements. The military will also never allow corrupt elements any place to hide,” Xinhua said. Both the party and the army, the agency said, had to understand “the long-term, complicated and arduous battle against corruption, and the need for the fight against corruption to be put in a more prominent position”. In separate and similarly brief stories, Xinhua also announced the expulsion of Li Dongsheng, former vice minister of public security; Jiang Jiemin, the former head of the state asset regulator; and Wang Yongchun, former deputy head of state energy giant China National Petroleum Company, all for graft. The party’s official People’s Daily, in a commentary on its website, said that the party should not be disheartened by setbacks represented by a few bad apples. Xu has been under virtual house arrest for months while helping in the probe into Gu Junshan, who has been under investigation for corruption since he was sacked as deputy director of the logistics department of the People’s Liberation Army (PLA) in 2012, sources previously told Reuters. “Military anti-corruption efforts have not reached this rank before. It’s very serious,” said Zhang Ming, an expert on domestic politics at Beijing’s Renmin University, noting that the fall from grace of earlier prominent military leaders like Lin Biao and Peng Dehuai were not related to corruption issues. President Xi has launched a sweeping campaign against graft since becoming party chief in late 2012 and president last year, vowing to take down powerful “tigers” as well as lowly “flies”. Xu is the most senior person to date to have been felled. However, a potentially far juicier scandal is brewing – the case of the powerful former domestic security chief, Zhou Yongkang. Sources have told Reuters that Zhou is under virtual house arrest, though the party made no announcement about his case. The buying and selling of military positions has also been an open secret, but Chinese media have generally avoided the topic. It is difficult to assess how widespread the problem is. For officers who paid bribes to be promoted, corruption is seen as a means of making a return on investment. Examples of graft include leasing military-owned land to private business, selling military license plates, illegally occupying military apartments or taking kickbacks when buying food or equipment. China’s President Xi Jinping attends a conference marking the 60th anniversary of the ”Five Principles of Peaceful Coexistence” at the Great Hall of the People, in Beijing, June 28, 2014. The president of China, North Korea’s only major ally, visits South Korea this week where the leaders of the two countries are expected to call on Pyongyang to end its pursuit of nuclear weapons, although Beijing will make sure it is not seen as taking sides. In a visit certain to be watched carefully in Pyongyang, President Xi Jinping will be holding talks with South Korean President Park Geun-hye for the fifth time in a year, without yet meeting the North’s leader, Kim Jong Un. North Korea’s nuclear and missile program, and its plans to hold a fourth nuclear test, will dominate the agenda, officials in Seoul said. “There will clearly be an expression of the commitment by the two leaders and their governments that North Korea’s nuclear weapons will not be tolerated,” South Korea’s Foreign Minister Yun Byung-se told parliament on Monday. “(The two leaders) are expected to spend considerable time discussing the North Korean nuclear and the Korean peninsula issues in depth, and we believe the atmosphere will be appropriately reflected in a joint document,” Yun said. China is usually very guarded in its opinion on North Korea’s nuclear program but Pyongyang’s three nuclear tests and several rounds of sabre rattling have tested Beijing’s support. In May, Seoul said South Korea and China had agreed at a meeting of their top diplomats that recent nuclear activity by North Korea posed a serious threat to the peace and stability of the region and Pyongyang must not conduct another nuclear test. Xi, however, is unlikely to step much beyond Beijing’s stated position calling for a negotiated solution to the issue through talks that involve the United States, while urging all players to refrain from actions that will further escalate tensions. Beijing has backed U.N. sanctions imposed on the North, but is also not expected to upset its balanced approach towards the two Koreas. Foreign Minister Wang Yi said in March that denuclearization on the peninsula was the only road to peace, and that China would not permit war or instability on its doorstep. Xi is also courting stronger economic and diplomatic ties with South Korea, a major trade partner, and his two-day visit includes meetings with business leaders of Asia’s fourth largest economy, including executives from Samsung, LG and Hyundai Motor. North Korea has sent a flurry of mixed signals over the past two days which has shifted some of the spotlight from Xi’s visit. It tested two short-range missiles on Sunday in violation of a United Nations ban. On Monday, it said it would put two American tourists on trial for crimes against the state. Pyongyang also came up on Monday with a fresh proposal for peace with the South, with which it is still technically at war. It offered to stop military drills as early as this week, which would coincide with Xi’s visit, in return for the suspension of annual South Korea-U.S. military exercises. Despite U.S. and South Korean pressure, China is likely to maintain that it is in no position to ensure that the North give up its nuclear arms. “The main player in this is not China, but the other two countries – North Korea and the United States,” said Li Changhe, a former senior diplomat who now works for the government-backed China Arms Control and Disarmament Association. North Korea’s Kim, who took power following the sudden death of his father in December 2011, has maintained contact with Beijing through high-level visits by officials from Pyongyang. However, the closest Kim came to communicating with Xi was through a letter handed to the Chinese leader last year through an envoy. His father Kim Jong Il went six years asserting his leadership domestically before traveling to China for the first time. Xi, who is due to arrive in Seoul on Thursday in his first visit to South Korea since taking office last year, is reciprocating Park’s visit to China a year ago. The Asian nations have one of the world’s largest commercial partnerships, with two-way annual trade at nearly $230 billion. China is South Korea’s biggest trading partner. South Korea is also one of the few major economies that runs a surplus with China, to the tune of $63 billion last year, thanks to exports of cars, smartphones, flatscreen TVs, semiconductors and petrochemicals. China’s trade with North Korea was just over $6 billion in 2012, according to South Korean government data. North Korea knows that its nuclear capability is the key reason it commands world attention, former Deputy U.S. Secretary of State Richard Armitage said. 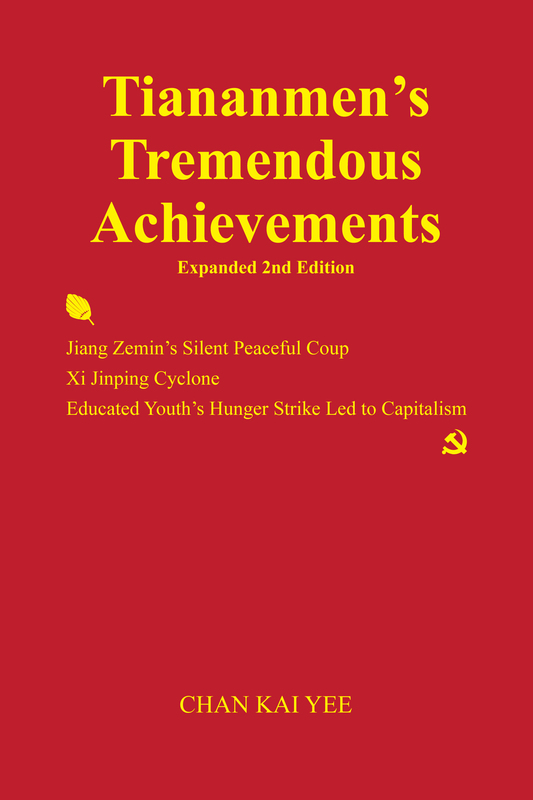 This is to remind those who are interested in buying my book Tiananmen’s Tremendous Achievements Expanded 2nd Edition that the big discount of 70% and 50% respectively for Kindle and print versions are effective only in June to commemorate Tiananmen Protests. After June, there will be no discount provided by me and the price of Kindle and print versions will respectively be US$9.99 and US$30.00 or their equivalents in other currencies. Amazon will perhaps continue to provide 10% discount on its own on the print version. I do not know whether there will also be discount on Kindle version. As he and I lived in the same lane and his house was only two houses further than mine, we walked home together at noon and in the evening and became friends. I knew that he was financially desperate then. His sister’s former husband was in prison for a counterrevolutionary crime, leaving her, a housewife, and their five children not provided for. It was very difficult for his sister to find a job at that time because China’s economy was recovering from the economic depression called by the Party as the three years of natural disaster; therefore, without the husband’s salary, they were starving. She could apply for poverty relief, but usually the government would move them out of Shanghai to remote areas, then her children might lose the opportunity of good education and jobs in Shanghai. Her husband’s younger brother was then single and earning a salary a little less than 100 yuan. The brother was willing to use much of his salary to support his sister-in-law’s family, but 100 yuan was indeed not much. It was hard to maintain two separate families with such an income. He had better move into his sister-in-law’s home so as to greatly reduce their living expense. However, he might be in trouble if there was merely a rumor that he had an affair with his sister-in-law, a counterrevolutionary’s wife. When the younger brother visited his elder brother in the prison, the two brothers discussed the matter and decided that the brother in prison should divorce his wife and then the younger brother should marry the elder brother’s wife. This was what I learnt from our maid before the Cultural Revolution. I do not know what actually happened between the two brothers. Our maid was of the opinion that it was a pity that when a man became a counterrevolutionary, he lost not only his freedom but also his wife and children. According to our maid, some of my neighbors thought that a man should not take advantage of his brother’s misfortune to rob his brother of his wife. I knew Walter’s sister. She was indeed beautiful. The brother must be happy to have such a beautiful wife. However, at that time she had had already five children and could by no means be regarded as young. Moreover, 100 yuan a month was quite a high salary at that time. On average a university graduate earned only 58 yuan and the average young worker’s wage was about 40 yuan. With such a high salary, it is easy for the brother to find a young and pretty girl to marry. I believe that either the brother was really a good brother willing to sacrifice himself for his elder brother or he was deeply in love with his former sister-in-law. By the divorce and remarriage, Walter’s sister was no longer a counterrevolutionary’s wife and her children no longer a counterrevolutionary’s children. They, especially the children, would not be discriminated in their pursuit for higher education and good jobs. Except in 1961, in the period from 1958 to 1966, as a rule, counterrevolutionaries’ children were not admitted into any tertiary education institution. At that time I believed that should be the major purpose of the divorce and remarriage. 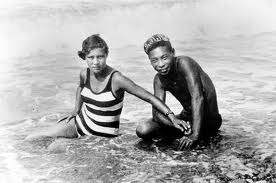 However, though divorce and remarriage were lawful in China at that time, Walter’s sister was looked down upon by some of her neighbors because of the Chinese tradition against women’s remarriage. Anyway, at that time Walter lived in his sister’s home where the eight people there had to live on a monthly income of about 100 yuan, 12 yuan per head. They were well below poverty line. One day on our way home, Walter told me that he was in trouble. I asked him why. He said his interrogators told him that they knew that Kuomintang leader Chiang Kai-shek’s son Chiang Ching-kuo (who was later Taiwan’s president) gave him a dinner and a Longines watch as a gift when he was giving performances in Nanjing before the communists came to power. I told him he had nothing to worry about that. As a well-known actor playing female roles, he certainly would have some contacts with Kuomintang high officials. I asked whether there was anything political in his contacts with them. He said no. They gave him dinners after they saw his performances because they liked his performances. I said that if so, he had nothing to worry. However, as there were surely reports about his contacts with the officials in the newspapers then, he had better tell his interrogators all such contacts before they found such contacts themselves in old newspapers. Chinese quite popular website qianzhan.com responds in its report to Bloomberg’s report on Xi Jinping’s recent speech to mark the 60th anniversary of the Five Principles of Peaceful Coexistence. Bloomberg says in its report titled “China’s Xi Urges Asian Security Framework to Counter U.S”, “China’s President Xi Jinping warned against any single power’s attempt to dominate” Xi refrained from calling names, but everybody knows Xi refers to the U.S. just as everybody knows that US pivot to Asia aims at China in spite of repeated denials by the U.S. In fact China’s principle of none interference in other countries’ internal affairs is quite flexible. When China regards the US as it leader, it loyally supported US bombing (military intervention) of Libya in 2011 in spite of the heavy losses it might suffer. Recently, despite its repeatedly advocated non-interference into Ukraine’s internal affairs, it did not say anything against Putin’s annexation of Crimea. Because in 2011, China regarded the US as world leader and wanted to be its ally though the US had no intention to be China’s ally. On the contrary, US launched its policy of pivot to Asia to contain China. US support for Japan and countries contending with China in the South China Sea broke China’s dream to be an ally of the U.S. China immediately turned to seek alliance with Russia. Now being Russia’s ally, it just turned a blind eye to Russia’s aggression. Perhaps, American people are happy to hear Obama say that the U.S. will be world leader for 100 years in the future. Some of them perhaps are afraid that China will replace the U.S. as world leader. No matter how strong China becomes, I hope China will not fall into the trap of world leader ambition. See how hard the US is now to keep its world leadership. It has to spend most of its financial resources to maintain huge aircraft carrier fleets so that whenever other countries need its intervention, it can send its troops there. It has even to fight wars to maintain its leadership. Due to the money squandered in war and fleets, the U.S. is now heavily in debt. It lacks the funds necessary to improve its infrastructure to deal with natural disasters. Shall China not learn from U.S. lessons to have the wisdom never to seek world leadership? I admire Chinese leaders wisdom in promising that China will never seek world hegemony no matter how strong it has become. However, I will never believe that China may keep its promises for 100 years. Who knows what will happen I the hundred years. 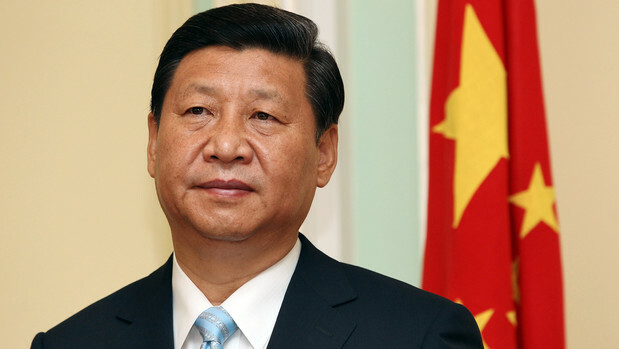 Seeking world hegemony or not is decided by China’s leader. 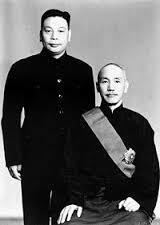 Mao want to grab the leadership of the communist world from the Soviet Union when China was very poor and backward. We Chinese people suffered a lot from starvation, poverty, unemployment, etc. due to Mao’s pursuit of world hegemony. Mao’s Great Leap Forward that gave rise to his Great Famine was precisely aimed at becoming the number one in the world. Xi warned against any single power’s attempt to dominate international affairs and said China will never seek hegemony no matter how strong it becomes. He spoke at a conference in Beijing yesterday to mark the 60th anniversary of the Five Principles of Peaceful Coexistence, policies that have directed the nation’s external relations since the 1950s. Qianzhan.com says in its report, “President Xi Jinping last month outlined his concept for the establishment of a new order of mutual cooperation and trust in Asia. The Conference on Interaction and Confidence Building Measures in Asia (CICA) comprises more than 20 Asian nations including Japan and the U.S. as observers. CICA’s goal is to improve cooperation on peace and security in the region. China’s Xi Urges Asian Security Framework to Counter U.S.
China’s President Xi Jinping reiterated his call for a new security framework for Asia, as the country’s claims over disputed territory increasingly challenge U.S. alliances in the region. China is seeking to cast itself as a major power in the Asia-Pacific and end decades of U.S. economic and military dominance in the region where it’s embroiled in tussles with Vietnam, Japan and the Philippines over territorial claims. U.S. Defense Secretary Chuck Hagel warned last month that China’s actions in parts of the disputed South China Sea are destabilizing the region. Xi last month outlined his vision for regional stability and a new security concept at the Conference on Interaction and Confidence Building Measures in Asia. The group, known as CICA, comprises more than 20 mostly Asian nations from Turkey to South Korea that aims to improve cooperation on peace and security in the region. Japan and the U.S. are observers. In his speech yesterday, Xi said nations should respect a country’s right to choose its own social system and model of development. They should also oppose attempts by any country to impose its views or oust legitimate governments through illegal means, he said. China’s Five Principles of Peaceful Coexistence, the cornerstone of its foreign policy, were laid out in 1954 by then Premier Zhou Enlai and were used to normalize relations with India and strengthen ties with Myanmar that year. Xi said the principles — mutual respect for sovereignty and territorial integrity, mutual non-aggression, non-interference in another country’s internal affairs, equality and cooperation for mutual benefit, and peaceful co-existence — can contribute to setting up a new model for international relations. Myanmar’s President Thein Sein and India’s Vice President Hamid Ansari were among foreign dignitaries who attended the conference at the Great Hall of the People. China has reached out quickly to the new administration of India’s Prime Minister Narendra Modi, sending foreign minister Wang Yi to the country on June 8, two weeks after Modi’s inauguration. While China and Myanmar had a close relationship during the five-decade rule of the military junta, ties have become increasingly strained since the country shifted toward democracy. China will boost gun training for police in its capital Beijing, a senior security official said, as it braces for what it calls an upsurge in militant violence around the country. The vice minister of public security and head of Beijing’s Public Security Bureau, Fu Zhenghua, urged officers to increase security in the city as he visited police stations and SWAT checkpoints along Beijing’s main thoroughfare, Chang’an Avenue, on Saturday. Police must be ready to “deal a deadly blow to enemies at the critical time”, the official Xinhua news agency cited Fu as saying in a report on Sunday. Chinese police do not always carry firearms, but top leaders have warned that security threats are mounting. Police in Beijing have already stepped up armed patrols after five people were killed and 40 hurt when a car plowed into a crowd and burst into flames near Tiananmen Square last October. The dead included three people in the car identified by authorities as Islamists from the western region of Xinjiang. Xinjiang is the home of Muslim Uighurs who speak a Turkic language. China has blamed previous attacks on Islamists it says seek to establish an independent state there called East Turkestan. Around 200 people have died in attacks blamed on Xinjiang militants in China in the last year or so, and the authorities have launched a campaign to stop the unrest, detaining hundreds and executing many others. 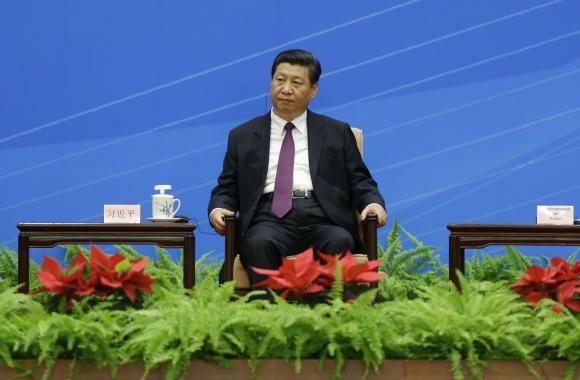 China will host an APEC summit on the outskirts of Beijing in November. This will draw heads of state and government from around the Asia Pacific region in one of the highest profile events to be held there since the 2008 Olympic Games.